Gibsonville is one of the Park's "vanished villages" and was located on the Silver Lake Outlet in the northern part of present day Letchworth Park. The penciled label on the top image says "G.W. West's Paper Mill". The following description is found in James Smith's history of 1881 Livingston County. 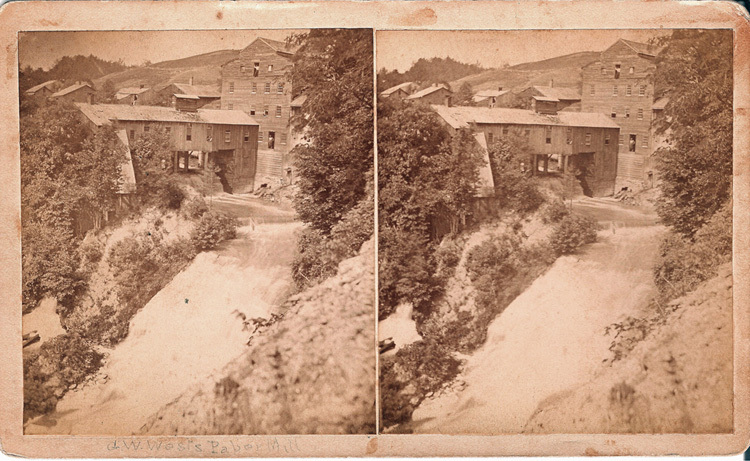 "The Silver Lake Paper Mills are located here (Gibsonville) and are operated by water power. Geo. H West is the proprietor. The buildings cost four thousand dollars; capacity of mill, 3,000 pounds per day; ten men employed. They manufacture rag, hardware, manilla (sic) and tea papers." For more information on this vanished village, see our Glimpse of Gibsonville and a 1872 map. Thanks to Karen Gibson Strang for sharing these wonderful images with us !